Spotify - the king of music streaming players? If you've ever used one of Apple's smartphones, tablets or Macs, you'll likely have come across iTunes, its software for playing music, videos and transferring media onto devices. Many people have a love/hate relationship with iTunes as it used to be the only program that could sync music to iPhones, iPads and other Apple devices. It's also been criticised for its slow loading times (especially in Windows), lack of features and non-existent support for a number of popular file formats, leading many to seek out an alternative. Apple's rivals caught on, and it's now possible to perform many of the actions previously tied to the program - such as synching media to iOS devices - using other media players. We've picked out five of the best to tickle your music fancy. It should be noted that while the following Windows programs are free, they will attempt to install third-party add-ons that aren't necessary for the programs to run. As such, you might want to manually opt out during the installation process. Spotify has quickly risen to become one of, if not the most popular music player around. It has a huge library of songs stored in the cloud that you can stream over the internet from your computer, smartphone or other mobile device. With new music being added all the time, Spotify has put an end to the days of ripping your CD collection to store in programs like Windows Media Player. The company has struck numerous deals with many large and "indie" record labels alike, meaning it has one of the most eclectic online song libraries around. 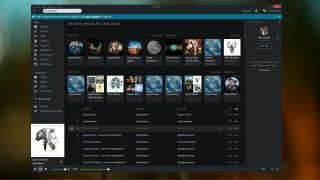 You can also add your own computer's music to a Local Library to sit alongside music in the cloud. In addition to creating and sharing playlists, Spotify allows you to "follow" artists and other users, queue up songs (handy for parties) and listen to tons of internet radio stations. Better yet, you can sync music from your library Apple devices, making it a potential iTunes replacement even for die-hard Apple enthusiasts. MediaMonkey is the music player of choice for the discerning music organiser. If you've previously filed hundreds of vinyls and CDs in cardboard boxes by genre, alphabetically or some other way, it will allow you to tame your collation obsession. The first time you load it up it will speedily scan your computer to find audio and video files, allowing you to then tag and sort them into columns - including by artist name, album, genre, composer, year, publisher, rating and so on. Where other media managers top out after a certain limit, MediaMonkey lets you add a massive 100,000 tracks. It's compatible with a wide range of formats - including MP3, WMA, W4A and M4P - and like iTunes, you can sync your library with iPhones, iPads and other Apple devices. Visually, the program isn't a million miles away from iTunes, and if you don't like it you can change its appearance by downloading "skins". Through extensions, Google's Chrome browser can perform many tasks usually undertaken on the desktop - and that includes sorting and playing media files. Through one particularly nifty extension imaginatively called MP3 Player, you can listen to music stored on your computer within Chrome, saving you from having to duck out to your music player. It comes with a few other features, including the retrieval of song lyrics, YouTube clips, relevant information about the artist playing and links to their Wikipedia page. On the negative side, it only supports MP3 and OGG formats, and it's not much of a looker. If you value convenience over aesthetics, MP3 Player could be for you. Venerable media player Winamp has been through some tough times since launching 18 years ago (including being killed off before being resurrected in 2014), but it's held its own against newer, fresher rivals surprisingly well. In a similar vein to MediaMonkey, it allows masses of music to be loaded into a central library, tagged and sorted to your heart's content. Additional functionality is provided through a rich database of plug-ins that let you do anything from installing jazzy visualisations to burning DVDs. Winamp is unashamedly retro and may be a better fit in its original form for anyone still on Windows XP or Vista. That said, a chance to blend the old with the new came when the makers of Spotify released Spotiamp, a lightweight media player that streams Spotify's extensive database of music in Winamp's original skin. If you're feeling nostalgic for Winamp's original look but don't want to leave your vast cloud-based music collection behind, Spotiamp is the answer to your prayers. Launched back in 1995, RealPlayer is a golden oldie. The program has matured into a slick multimedia tool that supports of a wide range of video formats - including proprietary RealAudio and RealVideo (RA, RM, RV and RMVB), in addition to MP3, MPEG, Windows Media Player and Flash Video (FLV). By acting as a central repository for all of your media files, RealPlayer lets you make playlists, bookmark videos on webpages, burn CDs, DVDs, stream videos and more. Recent versions have improved mobile support, and you can now transfer music from your smartphone to your PC, and visa versa. There's also support for Google's Chromecast streaming dongle, which means you can now plug one into your HDMI-equipped TV and download the RealPlayer app (on iOS or Android) to take advantage of a myriad of services - from Netflix and YouTube to BBC iPlayer.